Team Beachbody has just come out with a new fitness program called FOCUS T25. It is like the INSANITY or Asylum fitness programs however all workouts are only 25 minutes. It comes in three phases (so far) Alpha, Beta, & Gamma. Alpha and Beta come standard with the your initial purchase of the standard kit. I almost always recommend purchasing the standard, base kit first. I always recommend getting a Combo Kit with the Base program and with your favorite flavor of our SuperFood, meal replacement shake called Shakeology as it is a great deal when you combine the two for a discount. The Gamma phase will then be a separate purchase about 30 days before you complete the Alpha and Beta phases. It is my understanding that the Gamma phase will use weights while Alpha and Beta phases have no weight needed. So you start with the Alpha Phase and do that for five weeks. Then you do the Beta phase for the next five weeks. The idea for this shorter workout program is from our CEO Carl Daikeler. He was doing Insanity one day and was feeling dejected because he thought that his workout program for that day would take 60 minutes. He was very, pleasantly surprised when he saw that the current workout on his schedule was only 30 minutes. The rest of his workout and day was all amazing due to this short little workout and the excitement that he felt when he first figured out that it was much shorter than he expected! So he immediately called his product development department and Shaun T to design a workout program that will get great results and only take 25 minutes. This workout only has to be done 5 days a week (Friday 2 workouts are recommended). So at max you are only working out two and one half hours a week. 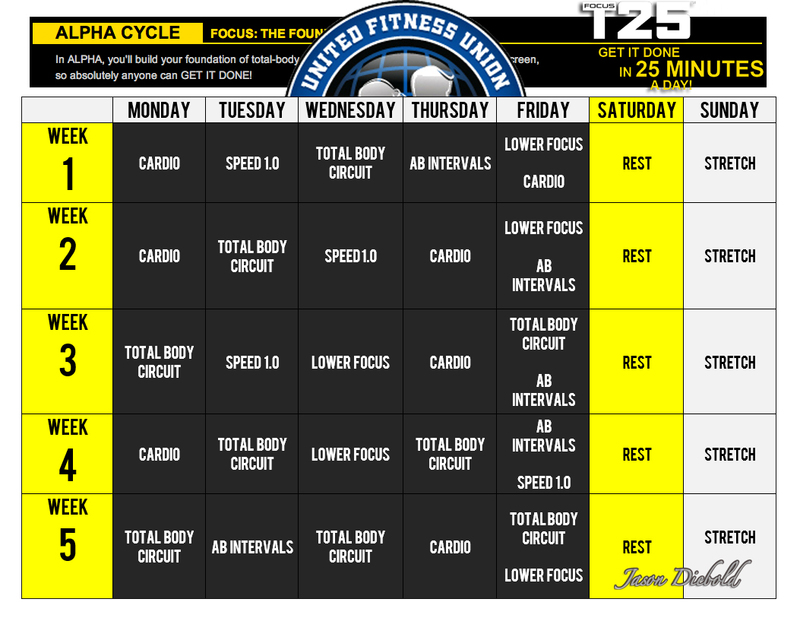 Thus FOCUS T25 was born! One of the thing that I appreciate most about this new workout program is that every workout has Tania Ante Baron in it as a modifier. Tania lost all of her baby weight using this program herself! The modifier in each workout makes this program doable for any body. Even someone new to working out or with knee issues as Tania takes all jumping out of the workouts! I have successfully done several of the awesome Team BeachBody workouts! My images have been included in several of the advertisements and infomercials for the company including P90X, 10 Minute Trainer and Body Beast. I don’t say that to brag or boast. I include it to tell you that this is a good serious workout comparable to the intensity of those other programs and so awesome because it only takes 25 minutes a day! My intention is to record every workout that I do for this program and do a review of each one. My hope is that my videos and work out routines will help to show you what this program is all about. To inspire and motivate you to accomplish your health and fitness goals too! If you have any questions about this or just general questions about your own heath of fitness or you would like to find out more about how you can be paid to help yourself and others accomplish their goals please contact me. I would be honored to help you accomplish you goals! If you are interested, I am looking for a couple of people who want or need to lose 20-30 pounds and want to do it in 10 weeks I run small focused support groups for individuals who have used the “I don’t have time to workout” excuse. This program is ideal for those with busy schedules, or for people who are short on time but want to “GET IT DONE” and have the best workout in the shortest amount of time. FOCUS T25 suitable for a broad range of fitness levels due to the modifier. If you know of someone that needs or wants to lose 20 – 30lbs in 10 weeks, please have them contact me. I will be post pictures of some of our most successful participants. Groups begin typically on the first Monday of each month.